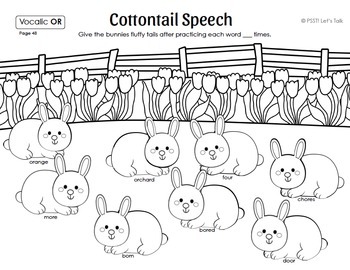 Spring has arrived in the speech room and your students will be delighted to give each bunny a fluffy cottontail with this low prep. articulation activity! 58 bunny pages targeting 23 different phonemes. 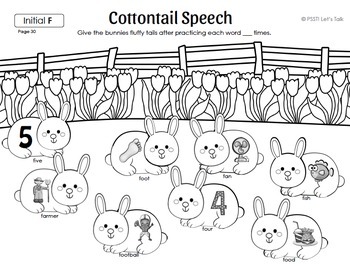 Bunny scenes are used to engage children interactive fun while working on speech sounds. Instruct children to produce each target word 5-10 times before gluing a fluffy bunny tail using a small pompom. Other options for bunny tails are torn pieces of cotton balls or white play dough. If you decide to use these pages as play dough mats, I recommend storing the pages in page protectors. 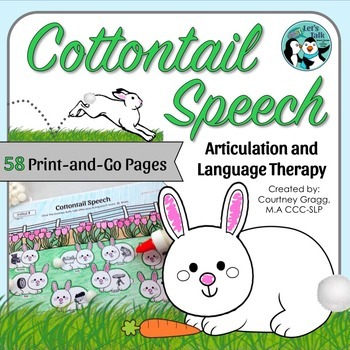 *Note: Articulation pictures are used on the rabbits for non-readers until page 46. Organization tip: store entire packet in a 3 ring binder with the cover page in the front. OR print pages as needed and store this digital resource on your jump drive.